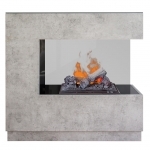 Standing fireplace with a modern design. Housing in veneer imitating betonn. The insert itself is also available as a separate product called Cassette 600.